Cambodia looks set to join a growing list of countries seeking the return of its cultural heritage properties and artefacts housed in museums and private collections in the west. I wonder if other Southeast Asian nations are involved in this conference in EgyptÂ – I can think of Vietnam and Indonesia who would also be interested in seeking the return of artefacts spirited away during the colonial period. If so, we might expect to see an increase of repatriation requests in SEAArch over the next couple of years. CAMBODIA will likely take part in a conference in Egypt later this year demanding the return of stolen antiquities that are on display in museums worldwide. The Kingdom would be one of 30 countries worldwide invited to the conference, which is scheduled to be hosted by Egypt in April. Cambodian officials applauded the initiative. â€œThis will be a gathering to send a message to the world, as well as individuals, to return antiquities to their origin countries,â€ said Hab Touch, director of the National Museum in Phnom Penh. Besides Cambodia, other countries participating in the Cairo gathering include Greece, Mexico, Peru, Afghanistan, Iraq and China, officials with Egyptâ€™s Supreme Council of Antiquities announced. Egypt, under the leadership of the Supreme Council of Antiquities head Zahi Hawass, has been in the news recently for seeking the repatriation of much of Egypt’s archaeological treasures such as the Rosetta Stone, and the concept of repatriation of artefacts is still a hotly-debated issue. 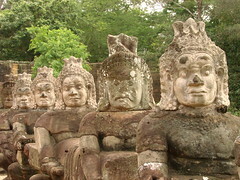 The full story about Cambodia’s intention to repatriate artefacts may be found here.